To make the pasta, on a large work surface, mound the flour and make a well. To the well, add the salt, whole eggs, egg yolk, water and EVOO, and mix with a fork, pulling the flour into the well to make a sticky dough. Work in the flour a little at a time with your hands to fully incorporate. Knead the dough in one direction away from your body, turning it into a smooth and elastic dough, 5-10 minutes. Cover with a kitchen towel and let stand for about 30 minutes. Cut the dough into 4 equal pieces with a bench scraper. Working with one piece of dough at a time (keep the dough that you are not working with under a clean kitchen towel to keep it from drying out), set your pasta machine to the widest setting and pass the dough through. Fold the dough over on itself in thirds and pass through the pasta machine three more times. Next, pass the dough through the machine decreasing the width with each pass until the dough is at the second to last setting, forming a 1/16-inch-thick sheet. Cut the long sheet in half crosswise and place the sheets on parchment paper dusted with “00” flour. Repeat this process with each piece of dough. FOR LASAGNA: Use the whole sheet or cut each sheet crosswise into thirds if it is easier to layer them this way. If using fresh pasta sheets, bring a large and wide pot of water to a low, rolling boil. Fill a pan with ice and water. Salt the boiling water and cook the pasta sheets 2 at a time for about 2 minutes. Cold-shock the sheets in the ice water to stop the cooking process. Drain on a clean kitchen towel and transfer to parchment paper. Stack the sheets neatly (you can do this ahead and freeze or store in the fridge until ready to use). Cut the squash into very thin slices (no thicker than 1/8-inch) with a very sharp knife or using a mandolin or the slicer blade on a box grater. In a large saucepan, melt the butter over medium heat. Whisk in the flour and cook for 1 minute. Whisk in 4 1/2 cups of the stock then the milk. Bring the sauce to a low simmer, whisking occasionally until the sauce thickens enough to lightly coat the back of a spoon. Season the white sauce with salt and pepper, and a little nutmeg. In a deep, large skillet, heat the oil (2 turns of the pan) over medium heat. Add the onion and garlic, and cook to soften, 5-6 minutes. Wilt the escarole into the pan and season with salt and pepper. Add the remaining 1/2 cup stock and simmer the greens for 3-5 minutes to cook out the liquid and bitterness. In Recipes-list.com we have selected the most viewed recipes from category - uncategorized . Enjoy the best recipes specially selected for you! 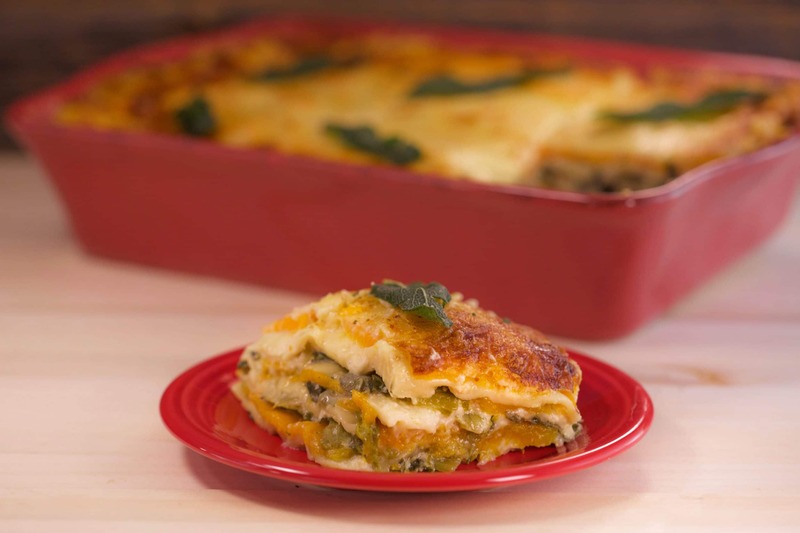 Butternut Squash and Escarole Lasagna is the right choice that will satisfy all your claims.